Yesterday I didn't get any plotting done for "Snowed in with a Millionaire. I spent most of the day at my parent's house because we had a guy reglazing the tub in our house. Bad excuse, I know. I found a great article from eHarlequin.com by Brenda Janowitz that I wanted to share a part of. Structuring Your Story A three act structure—all good stories have it. This is fundamental. Not only should your story follow this structure, but your scenes should as well. Red Dress Ink books read light and breezy and conversational, but chick lit still follows the conventional rules of fiction. 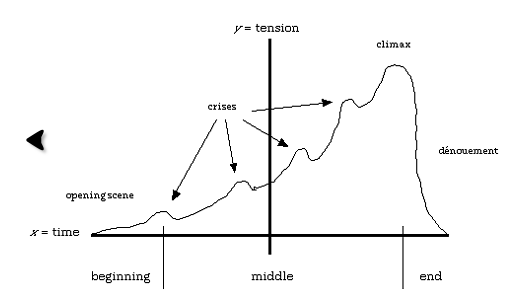 Once we talk about the three act structure, you should start thinking about the stuff you love and its structure. A good take-home exercise for you would be to analyze your favorite books and movies for their three act structure. The set up—show your protagonist’s natural habitat—her day to day life (this is necessary to measure the change she undergoes through her journey). The inciting incident—the thing that happens that sets a course of motion—the reason why your protagonist goes on her journey. The point of no return—your protagonist is so committed to her goal that she cannot turn back. The middle—your protagonist begins to try to achieve her goals Here, she can either achieve her goal and find a new one. Resolution—What does your character learn, prove or discover? This is where we begin thinking about themes and what we are really trying to say. She goes on to break down the three part structure of Mean Girls. Check it out, it's fascinating. Today I will work on my plot for "Snowed in with a Millionaire" and scroll through the NaNoWriMo forums!